Are you aware of THIS penguin? Home > Blog > Are you aware of THIS penguin? Penguins are a popular bird—probably an easy favorite for most people. With so many fans, it only makes sense that we have a day dedicated to penguins. And, actually, o ur love for these flightless birds runs even deeper as there are two days throughout the year that we’ve dedicated to penguins! Today is Penguin Awareness Day, which consistently lands on January 20 (not to be confused with World Penguin Day—which consistently lands on April 25). There are 17 different species of penguins—all of which live in the southern hemisphere of the world (unless they live in the zoo). Penguins are naturally found in Antarctica, South Africa, Australia, New Zealand, Chile, and Peru, as well as the Falkland and Galapagos Islands. 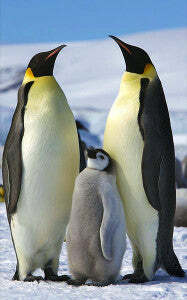 The biggest of the 17 species of penguins is the Emperor penguin. Reaching an average of 4’ in height, and weighing anywhere from 50 to 100 lbs, Emperor Penguins are quite a big bird, but I know of a penguin that was even bigger! 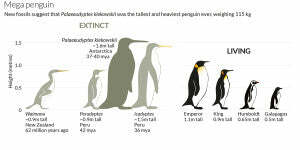 It may surprise you to discover that the cute, waddling penguins that we know and love today would have, at one point, towered over the majority of modern man! Along with the end of the dinosaurs, the era of mammals brought drastic changes to life on this planet as well as this big bird that stood 6’ 7” tall. Yep, you read that right: these cute, blubbery birds stood much taller 37 million years ago than they do today. It’s been called ‘The Colossus Penguin’ (also known as Mega Penguin) and they came around at the same time as the world’s first horses, whales, and monkeys. While the penguin may have arrived in the era of mammals, they cannot be exclusively classified as such because they live both on land and in the water. This bird is classified not only as a mammal, but as a fish and an amphibian as well. It’s no wonder that we find these creatures so fascinating! Happy Penguin Awareness Day, Everyone! You can learn more about our feathered friends here. And, as always, thanks for reading.